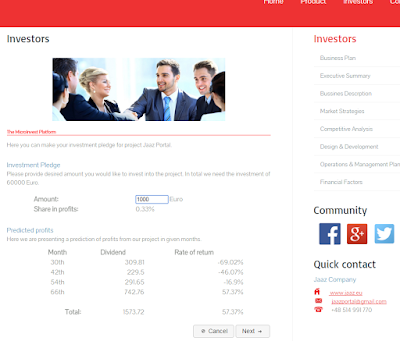 The Jaaz company is offering up to 20% share in the profits from the Jaaz Portal project. We need an investment of 60 000 Euro to make this project a reality. While we already started some developer works we need to find investor to assure stable work of our company and successful launch of new project. In exchange for investment we are offering up to 20% share of the profits that our project will make. It will give average annual rate of return on the level of 11.8%. No bank will give you such a profit. Thanks to our MicoInvest platform everyone can become stakeholders in our project. We are collecting pledges of investment starting from as low as 100 Euro. Do not wait for others, become Jaaz Portal investor and take a share in our future. Invest today. We are presenting a new component called MicroInvest. It is a tool that we want to use in obtaining founding for our project. You can help us and spend 2 minutes on testing it. The idea is simple. Crowdfunding have his limitations. It does not allow founders to gain a share in the project profit. To change this we had developed idea of MicroInvest. Unlike in standard crowdfunding model, in MicroInvest we are sharing a percent from the future income with all investors. By investing, even 100 Euro, you are becoming shareholder of the project. We are still developing this component but you can help us and test it. Please register using your Facebook account and fill the form with some random data. After confirming you shall receive an email letter and if such option was choose our system would publish short information on your Facebook account. You can just delete it for now or disable this option during filling the form. If you will encounter any problems please write to jaazportal@gmail.com. Every help is appreciated. In future we will reward our testers with some nice bonuses. You can test this component on our development server. Click on button on bottom of page. We had created brand new promotional video. Please watch it and invest into us. Jaaz Portal is a highly integrated portal and web-hosting service for unskilled users of social networks wanting to have fully featured portal for their own, community or business use. We had updated our Business Plan. Some typo was fixed and the income tables updated. 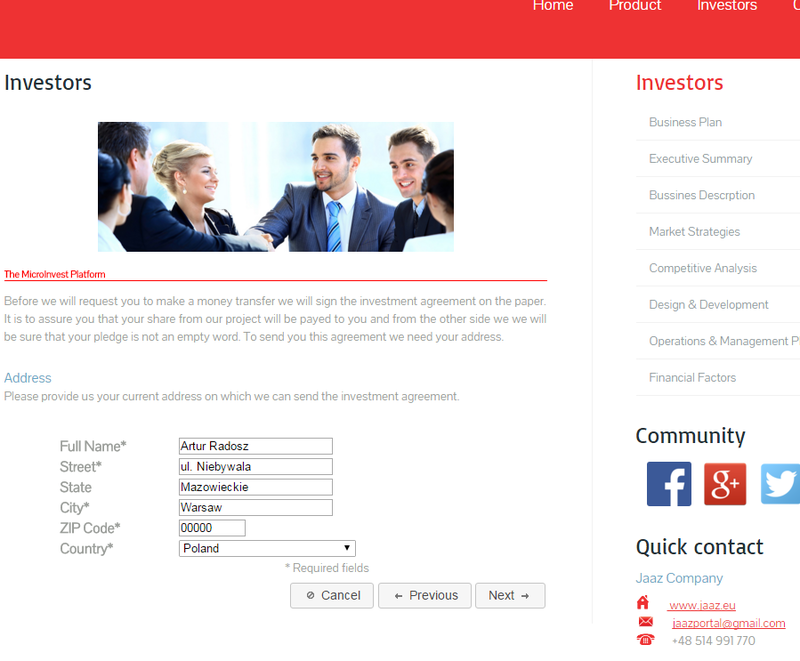 Also Portal Guide has been updated by adding information on MicroInvest and two components in Business Edition. 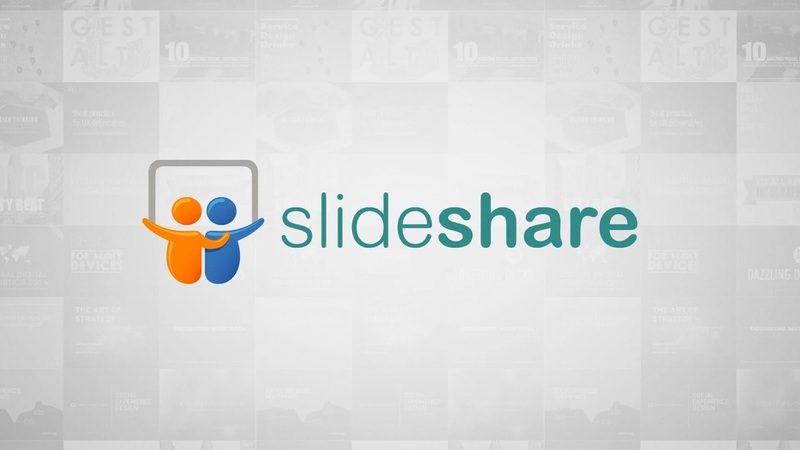 To the investors section we had added a Power Point presentation of our business. 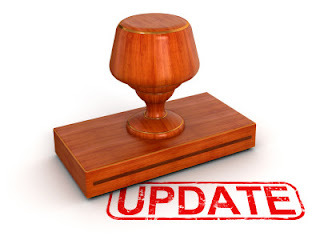 The changes has been pushed also on our project homepage. For everyone interested in our Jaaz Portal product we had create a Power Point presentation with short overview of the project. If you are interested in investing into it you will find there basic information. For more information on investing into Jaaz Portal please visit the project home page or contact us. 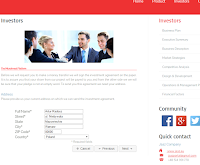 Jaaz.eu is looking for serious investors ready to invest in our new Jaaz Portal Project. Invest into the future and gain over 100 000 Euro in just 5 years. We are small software house established in 1998 in Warsaw, Poland. We was working with many Polish customers providing our consulting services and web designer skills. In February 2015 we had been joined by Artur Radosz. Java developer that have experience in work with top polish corporations like Orange Poland, the Polish Mint or PZU insurance company. 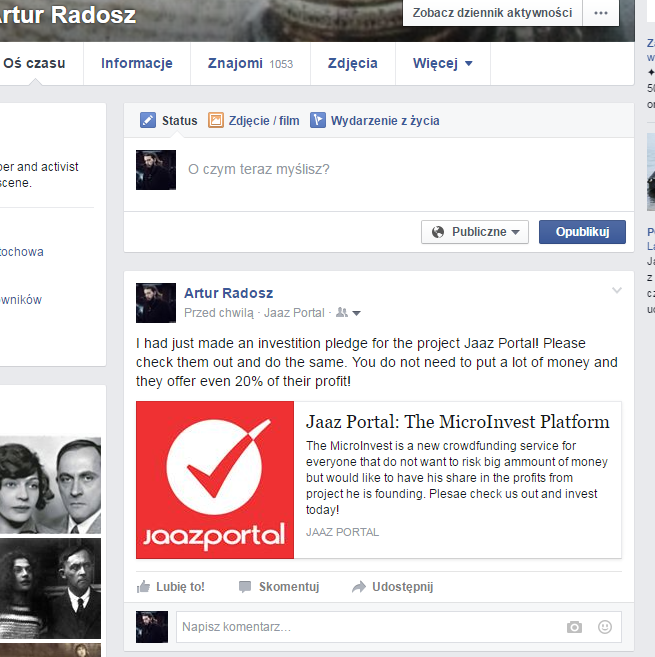 He has started a work on our new project that we had named the Jaaz Portal. 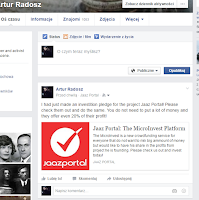 Jaaz Portal is a highly integrated portal and web-hosting service dedicated to average Facebook or Blogger users. With easy to use web wizard and management console they will be able to create professional portals for own, community or commercial use. 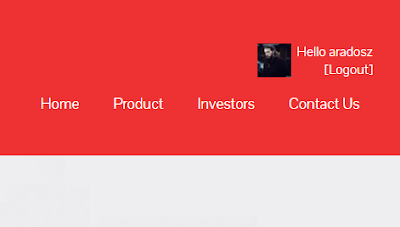 We had started already some developer works but we are foremost looking for investors. We need investment of 60 000 Euro. In 5 years we are going to bring profit of at least 410 000 Euro. To bring profit of 410 000 Euro we need only 1850 customers what is 0.00007% of global growth in next four years. We can be much more profitable that this 'dark scenario' that we had used for creation of our Business Plan. For 60 000 Euro we are offering You 25% share in our profits payed after first three years of operation of the project. If You want to invest less money the share we can offer You will be proportionally smaller. Please view our Business Plan and contact us if You are interested in further talks on investment into Jaaz Portal Project.